Acupuncture is traditional Chinese medicine in which they stimulate specific points on the body by inserting thin yet solid needles through the skin. Cupping and herbal remedies can also be part of the treatment. Acupuncture can be fantastic for chronic pain and can be used to treat any type of illness as it is seen as a complete medical practice. Acupuncture and massage are complementary therapies and can be done in conjunction for a holistic approach to injury or recovery. Stephanie Hylla at Mankato Acupuncture clinic. Mankato Acupuncture Clinic is the private practice of Stephanie Hylla. She is licensed by the Minnesota Board of Medical Practice, and is a National Board Certified Diplomate in Acupuncture by the National Certification Commission for Acupuncture and Oriental Medicine (NCCAOM). 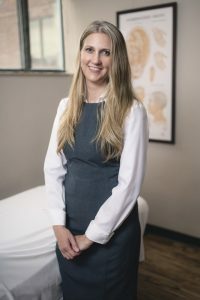 Stephanie graduated with a Masters Degree in Acupuncture from the Minnesota College of Acupuncture and Oriental Medicine at Northwestern Health Sciences University in Bloomington, MN, and received her undergraduate degree from the College of St. Benedict in her hometown of St. Joseph, MN. In the spring of 2011, Stephanie traveled to China and completed a Certificate of Study at Tianjin University of Traditional Chinese Medicine. During her graduate work, Stephanie trained in Minneapolis, MN at the Courage Center treating stroke, spinal cord and traumatic brain injuries, as well as The Aliveness Project treating persons living with HIV/AIDS. Stephanie also had considerable training in treating alcohol and drug addictions at the Salvation Army, Minneapolis Harbor Lights. She became curious about acupuncture and Traditional Chinese Medicine at a very young age but didn’t experience it until her fourth pregnancy left her with excruciating low back pain. Once she discovered that acupuncture could relieve her pain by 50-75%, she was convinced this was the path she needed to take. Stephanie is very passionate about what Traditional Chinese Medicine has to offer and has a wonderful desire to educate the public in how it can complement any level of health care treatment. It is her mission to show how both Eastern and Western Medicines can work together to fulfill the common goal of giving people the best healthcare options they deserve.